Commentary and analysis accompanying this data is provided on Dave's Landslide Blog. Allowing for the slight change in camera angle, there is little indication of major change between the two images. The large boulder on the left side of the upper part of the channel bank has slipped into the water on the right hand image, presumably indicating that channel widening is continuing. Of course there may well be some continued erosion of the bed that would is not visible here. It may be that a more detailed inspection on the ground would reveal a more dynamic system. 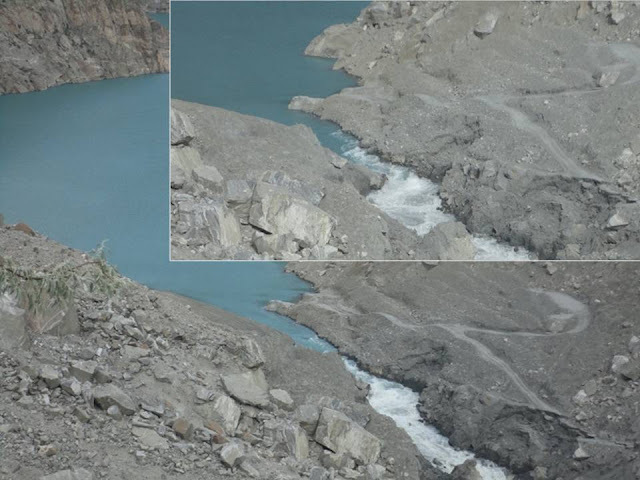 It is my intention to stop duplicating posts on the two sites from today, with the Hunza Monitoring Blog being used once again to present data on the state of the dam and the lake, and Dave's Landslide Blog to provide a commentary. On DLB I will also start covering other landslide events again. The current state of play is I think as follows. Flow appears to be constrained by two blockages but, as a commenter has noted, one is a rock spur out of the channel. The blockage appears to have formed a small waterfall / rapid. Downstream of the blockage the channel has widened dramatically - and indeed a section of the track has now been lost. To me this suggests that the crisis may be far from being over. In particular, the loss of this barrier could cause a rapid increase in flow rate that could be highly erosive. It is however important to stress that interpreting the state of play from photos is difficult. Apologies to all who emailed and left messages over the weekend requesting updates. Thus, the discharge is apparently stabilising. Various media reports from the site itself suggest that downward erosion of the channel has now reduced, but that some lateral erosion is still occurring. I have not seen any images to confirm this though. The lake has stopped rising for now. Thus, NDMA have a huge challenge ahead in deciding when to allow people to move back into the high hazard area. They will also need to decide whether to initiate erosion through the use of a controlled blast. This is not an unenviable decision to make. Inevitably, there are some exerting pressure to initiate a breach to drain the lake, whilst others are happy with the status quo. Meanwhile, of course those on the upstream side remain isolated, with a huge lake impeding access. 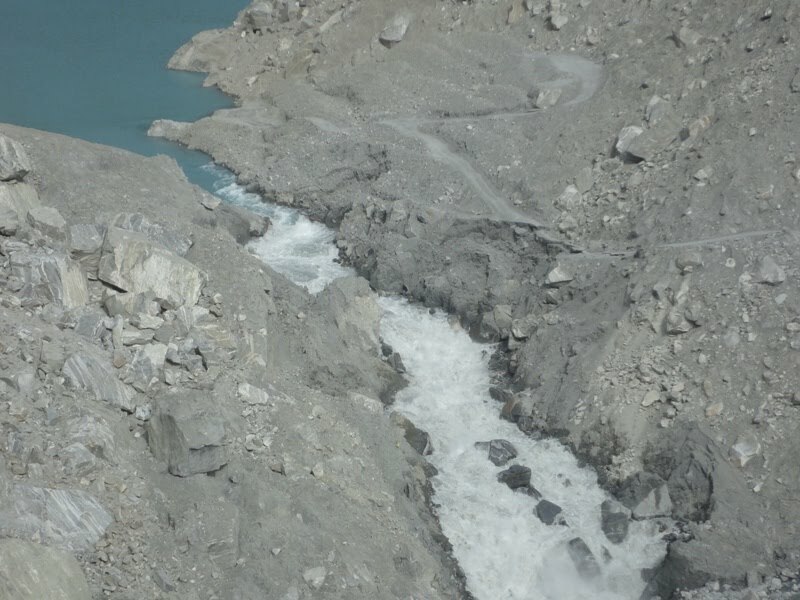 The Karakoram Highway remains closed indefinitely, although the boat service has been resumed. 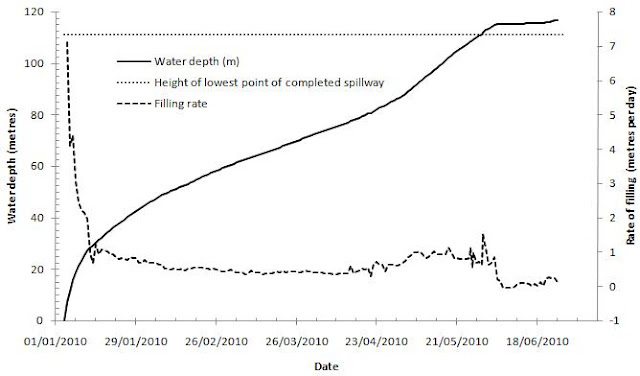 During summer floods, when inflow may briefly exceed outflow, the lake level could rise again by a small amount, unless progressive erosion of the spillway serves to lower the lake level. Thus, overall, many challenges remain at Attabad. ; it will be interesting to see how NDMA responds to them. 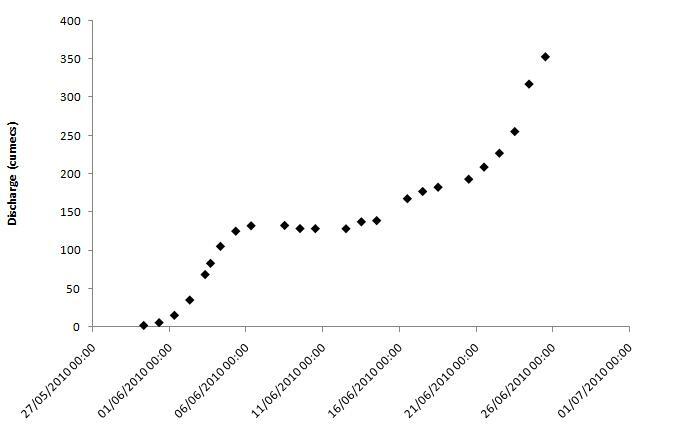 This suggests that we are still seeing an incremental increase in flow. However, interestingly, the rate of inflow and the rate of outflow now appear to be balanced, such that the lake level should stop rising (for a while anyway). If this happens, and spillway flow continues to increase, we will know that erosion is developing. Focus have kindly provided a new set of images of the situation at Attabad with respect to the spillway. I think that these images were taken yesterday. It is clear that the situation has developed considerably over the last few days. 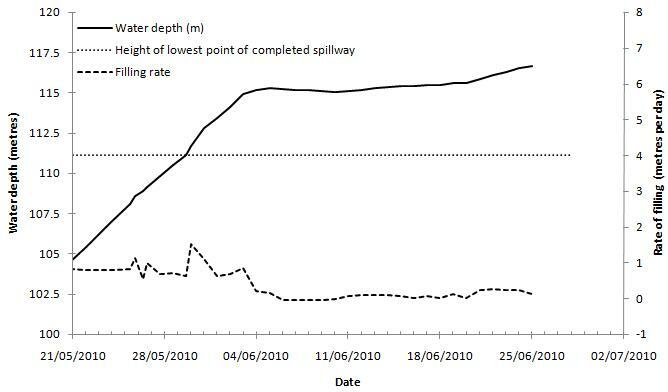 The flow along the spillway has increased greatly, and the lower part of the channel has widened and deepened. Flow appears to still be controlled by the large boulder in the middle of the channel, although the lowering of the channel downstream will be steadily undercutting this.The development of the spring on the channel edge is also interesting. The flow is undercutting the banks, which are then progressively failing. Note also just how much scour is occurring even though the bed of the channel is boulder-strewn - it is clear that at the moment the boulders are not armouring the channel. 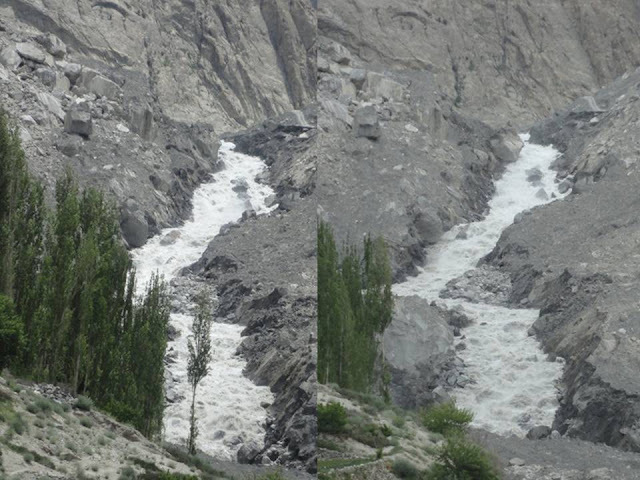 It is clear that the flow is still rather modest, despite the huge amount of erosion that the water has achieved.